Altitude ranges from 9000 ft (2,750 m) at Kargil to 25,170 ft (7,672 m) at Saser Kangri in the Karakoram. Winter: -20oC and below in the higher reaches. Winter: Heavy woolens with wind proofing. The flight into Leh, the capital of Ladakh, is an exciting experience as you fly over the dramatic regions of the Himalayas, the Great Himalayan, Zanskar, Ladakh and the Karakoram. This area is highest inhabited region of India and the River Indus with its tributaries flows through the ranges. Ladakh is a separate province of the State of Jammu and Kashmir and distinct in its culture and topography. It is a region which was opened to tourists only a few years ago. Since then, foreign tourists, particularly a large number of young visitors are traveling to Ladakh to see its unspoiled beauty. The landscape of Ladakh is glorious but stark – the surrounding mountains are painted in colors that only Nature could choose. Only adventure lovers are recommended to visit Ladakh – Ladakh should not be compared with a Hill Station like Srinagar. The region is predominantly Buddhist and several important Buddhist monasteries dominate the region. 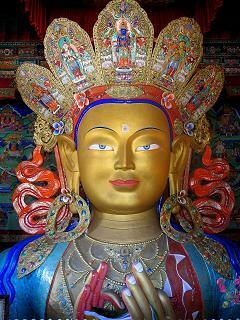 Some of them are located within visiting distance from Leh and normally day excursions are ideal to visit most of them. The clean, dry air, magnificent scenery and the warm hospitality of the Happy people makes Ladakh truly memorable. The territory of Ladakh represents some 70 per cent of area of the State of Jammu and Kashmir with the lowest density of population in the world – less than one or two per square kilometer. The effect of elevation and isolation amidst snowy mountains has made the countryside forbiddingly arid and produced one of the most unusual climates in the world. Burning heat during the day is normally followed by extreme cold at night and dry cold air makes you feel its presence. The average annual rainfall is less than four inches. As you drive up and down this arid, barren, sun-beaten and wind-swept countryside, you may get a peculiar feeling that you are somewhere on the lunar surface – this topography character has given Ladakh the term “Moonland”. Though Ladakh seem to be remote but it has never been totally isolated. Over the centuries the trade route from India to Central Asia passed through this area through its high passes and desert landscape. Caravans carrying spices, brocades, pearls, carpets, tea and other goods of daily needs took around two months to cover the distance from Amritsar in the Punjab to the Central Asian towns of Yarkand and Khotan! Leh and Kargil profited from this ancient route and also developed into the centers of trade. Since 1962, the fear of Chinese invasion made Indian Army to send a large contingent of the army to different areas of Ladakh. The army present here has been very significant for the political reasons but it has also done a lot good to the tourism of Ladakh. The requirement of the Army to reach to the strategic points has resulted in better infrastructure of roads and Ladakh has become for the rest of India reachable and the region seems to be now ‘opened up’. Near Leh in the upper Indus Valley there is the cultural heartland of Ladakh, where the old capitals of the area and many of the splendid palaces and Gompas (monasteries) can be found. Ladakh has an area of approx. 98,000 sq km., situated at an altitude of 2,500 to 4,500 meters with some of the passes at 6,000 and peaks up to 7,500 meter all around the region. The mountains of Ladakh do not seem to be very impressive, the reason being the city of Leh is situated already at an altitude of 3,500 m and the mountains appear only 3,000 m higher and they do not look any bigger than the Alps. Ladakh is really a desert area and there is only little snow on them and they look like big brown hills making the impression of being dry and dusty. Yet visitors still find that Ladakh is a magical and remote place with its happy people. The four mountain ranges of Great Himalayan, Zanskar, Ladakh and Karakoram pass though the region of Ladakh. Ladakh also has the world’s largest glaciers outside the poles. The towns and villages occur along the river valleys of the Indus and its tributaries, Zanskar, Shingo and Shyok. There is also the large beautiful lake Pangong Tso which is 150 km long and 4 km wide at a height of 4,000 m. Due to necessity and adverse conditions people of Ladakh have learnt to irrigate their fields. In the fields barley is the main crop which is turned into tsampa after roasting and grinding. Apple and apricots trees are also grown with success. Most of the crops are reserved for the hard winter time. At lower altitudes, grape, mulberry and walnut are grown. The willow and poplar grow in abundance and provide fuel and timber, especially during the winter. These trees are also the source of the material for basket making. The fragrant juniper is reserved for religious ceremonies. It is burnt at several occasions by the Buddhists filling the atmosphere with its fragrance. In peak winters the temperature in Ladakh goes down to -30oC in Leh and Kargil and -50oC in Dras. Temperatures remain in minus for almost 3 months from December to the month of February. But on clear sunny days it can become very hot and one can get sun burnt. Rainfall is very less due to the geographical location of Ladakh. The rainfall is around 50 mm annually. It is the melting snow which makes the survival of human and animals possible. In the desert like landscape one may come across the dunes or perhaps occasionally to the dust storms. Although, most of the places in Ladakh are more or less cut off for 6 months from rest of the world , the state has retained cultural links with its neighboring regions in Himachal Pradesh, Kashmir, Tibet and Central Asia and also traded in valuable Pashmina, carpets, apricots, tea, and small amounts of salt, boraz, sulphur, pearls and metals. Animal transportation was provided by yaks, ponies, Bactrian camels and hunia sheep with broad backs. Livestock is a precious contribution to the economy of Ladakh, especially the yaks and goats play an important role . Yak provides meat, milk for butter, hair and hide for tents, boots, ropes, horns for agricultural tools and dung for fuel thus paying the most vital role in the local economy of the region. Goats, especially in the eastern region, produce fine pashmina for export. The Zanskar pony is considered fast and strong and therefore used for transport and for the special & famous game of Ladakhi polo! The people of Ladakh are predominantly Buddhist and practice Mahayana Buddhism influenced with the old Bon animistic faith and Tantric Hinduism. Bon religion and Tantrism involved rituals to fulfill the wishes and so they were very popular before Mahayana Buddhism dominated. There are four main groups of people. The Mons who are of Aryan stock are usually professional entertainers, often musicians. The Dards are found along the Indus valley, many converted to Islam, though some remained Buddhist. Tibetans form the bulk of the population in Central and Eastern Ladakh, though they have assumed the Ladakhi identity over generations. The Baltis who are thought to have originated in Central Asia, mostly live in the Kargil region. The Ladakhis are hardy, cheerful and live close to nature. 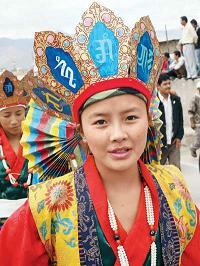 The Ladakhis wore the goncha which is a loose woollen robe tied at the waist with a wide coloured band. Buddhists usually wear dark red while Muslims and nomadic tribes often use undyed material. prevails, there are mosques and imposing Imambaras in the Islamic style, surmounted with domes. Most of the mosques in Ladakh are influenced by the Persian architecture. With the exception of those places on trade routes, Ladakhi society has been very introverted and for long time has been isolated from the rest of the world. The economy developed in such a way that it was self-sufficient, but not an easy development in such a hostile environment like in Ladakh. Ladakh also developed a very distinct culture which was otherwise not observed in other parts of the Indian subcontinent. Polyandry was common in the Ladakhi Society. Women were allowed to become monk and so in the past many women became monks. The harsh climate caused high death rates, which resulted in a stable population based on the limited agriculture activities which could take place in the environment of Ladakh. In the recent times, the society has changed rapidly. Imported goods are becoming widely available and more and more people are involved in the trading and selling of goods. Traditional Ladakh is being quickly brought in step with the 20th century. Ladakh is open to tourists only since 1974 and has attracted already a large number of tourists and the influence of the tourists does not remain unnoticed on the society as a large number of people, especially in the capital Leh has to do directly or indirectly with the tourists. Travel by road gives you an advantage over flying into Leh as it enables you to acclimatize easily. As Leh is situated on a high altitude plateau and if one books the journey with Indo Vacations and travelling by Jeep or car will give you the flexibility of stopping to see the several sights on the way. Srinagar – Leh road (434 km) is the main route with an over night halt at Kargil. The road is open between mid June and November. The Manali-Leh highway is a spectacular journey with an over night halt at tented camps at Sarchu or Pang. Kargil is situated on the main highway between Srinagar and Leh. The road from Kargil into the Suru and Zanskar valleys is open only between July and October. Leh is the main airport for this area. Direct flights link it to Delhi, Srinagar and Jammu. At Leh and Kargil, accommodation is available to suit all budgets. Hotels are rated as A,B,C and economy categories while guest houses fall under, upper medium and economy class. Most of the hotels are run by family and providing services that are more personalized than professional. In Leh, guest houses located in residential houses offer rooms with facilities that range from good to basic. Tariffs are low and they give visitors a chance to see and experience the life of the ordinary Ladakhi. During peak tourist season early June to mid September, it is advisable to book rooms in advance. In winter too, advance booking is essential to ensure provision of heating arrangements during the intended stay. All visitors must ensure they are physically fit before visiting Ladakh and Lahaul and Spiti. The high altitude environment is demanding. People with heart or lung disease must consult their doctor before planning a trip. Acclimatization is mandatory for visitors traveling by air. It is important to take complete rest for the first 24 hours after arrival and as much rest as possible for the next 12 hours. People traveling to altitudes above 10,000 ft. (2700m) are likely to suffer from Acute Mountain Sickness. The most common symptoms are, disturbed sleep, loss of appetite, nausea, coughing, irregular breathing, breathlessness, lack of concentration. In its more serious form, Acute Mountain Sickness can be life threatening and so needs immediate medical attention.